VBS Calming Supplement for Dogs offers dogs an expertly formulated supplement, developed to calm and settle anxious dogs naturally, effectively and safely. These soothing capsules contain pharmaceutical grade L-tryptophan, an essential amino acid which is converted to serotonin in the brain. 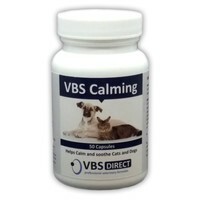 VBS Calming also contains the herbs ashwaganda, Chamellia sinesis extract and valerian root which to help soothe and relax your dog.